-I saw Maleficent last night. It’s wildly uneven (critics seem to agree), but Angelina is pretty damn great in it and was clearly having a blast. And the director certainly recognized how much the camera loves her; I stopped counting how many tight, lingering closeups of her face we’re treated to. Even with the not great reviews, it’s expected to open at No. 1 this weekend. -Brad Pitt was punched in the face by a stupid prankster at last night’s Maleficent premiere. This is the same idiot who stuck his head up America Ferrera‘s dress at Cannes and attempted to kiss Will Smith. -Speaking of the Maleficent premiere, the stars stayed true to their characters with their style. 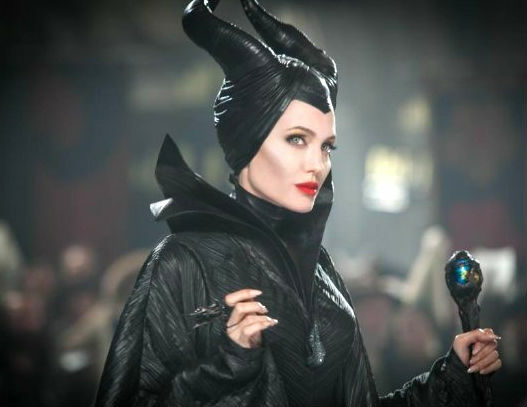 Angelina Jolie embraced Maleficent’s darkness in an inky Versace, while Elle Fanning went full princess. –Kim Kardashian and Kanye West‘s honeymoon in Ireland sounds weirdly normal and low-key. They have been spotted mountain biking, having a picnic, drinking Guinness at a pub, and going to the movies. -Also, Kim officially changed her name — on Twitter, anyway. –Madonna got out of jury duty this week with a doctor’s note. Too bad she then blew her cover by posting all her fun adventures on Instagram. -In a new HBO movie, Robert De Niro talks about the complex relationship he had with his late father, an openly-gay painter. –George Clooney and fiancée Amal Alamuddin‘s enjoyed a romantic date in Venice, just in case you didn’t already hate life. -As good as Hannibal is, I always struggle to watch it because it’s just so damn bleak and nihilistic. At least the cast looks like they’re having fun in this new gag reel. -Speaking of Justin, he reportedly shoved a girl at a club in Cannes and had to be restrained. Charming. -Also, he reportedly hooked up with model Adriana Lima when in Cannes. -Reading Rainbow meets its $1M Kickstarter goal in less than a day, makes Levar Burton cry. -DVR alert: Fox is burning off the remaining four episodes of Enlisted starting this Sunday. Rumours of just how close it came to being renewed are doubly depressing. -Meanwhile, Fox chairman Kevin Reilly announced he’s leaving the network, which is a shame. This is the guy who tried to abolish the antiquated pilot season, and it was a good plan. Instead of each network making an episode of 20 or so shows every season and then only ordering a handful, he wanted Fox to focus on just a few shows and have time to tweak them, like HBO. That’s probably why the Gotham trailer looks better than anything else coming to TV this fall. -In other geeky TV news, I really liked this article on how current sitcoms are suffering from a lack of conflict. –Marilyn Manson is joining the Sons of Anarchy cast, which actually makes a lot of sense. –Justin Timberlake sparked controversy with an Instagram pic of himself praying at the Western Wall in Jerusalem. –Prince Harry has been busy these past few days, playing soccer with some adorable school kids, wearing top hats, making pizza with children and just being generally awesome. –Uma Thurman and Quentin Tarantino might be dating, fulfilling his lifelong dream. -Good on Orange Is the New Black’s Laverne Cox for landing the cover of Time. -I’m not getting my hopes up about Hulu being in talks to resurrect Community. It’s still way too early for that. -A new trailer for the Annie remake has landed. -Speaking of trailers, here’s a new one for Daniel Radcliffe and Zoe Kazan‘s adorable rom-com What If (which was called The F Word when I saw it). –Jeremy Renner stars as journalist Gary Webb in Kill the Messenger, the first movie he’s produced. The cast is stacked!